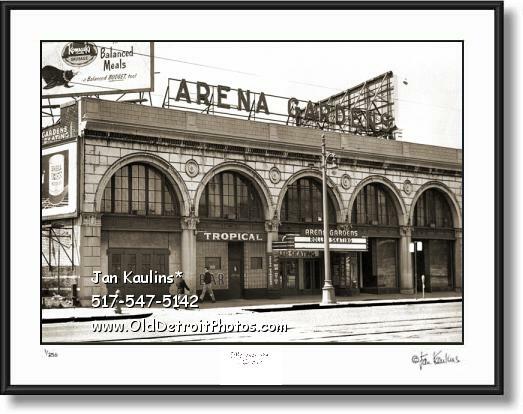 ARENA GARDENS ROLLER RINK DETROIT photo print picture for sale. This sepia toned black and white 1953 ARENA GARDENS ROLLER SKATING RINK Detroit photo print was made from a restored Original black and white historic vintage 1953 Arena Gardens Roller Skating Rink archival photograph. The Detroit Arena Gardens Roller Rink, like hundreds of other rinks across the US, served the social and recereational needs of thousands of Detroiters. Noted across Detroit as well as the United States for its professional staff, skating clubs, organist, and even its refreshment counter, the Arena Gardens quick attained a legendary status after it opened in 1935. This is a very unique and rare historical photo of the exterior and entrance to this Detroit skating landmark 1n 1953, about 20 years after it opened. At the top left side of this photo we see a billboard advertising Kowalski Sauge---another Detroit area staple . THESE BLACK AND WHITE DETROIT PHOTO ART PRINTS ARE VERY HIGH QUALITY REPRODUCTIONS OF ORIGINAL OLD VINTAGE HISTORICAL DETROIT PHOTOGRAPHIC PRINTS. THESE SEPIA TONED DETROIT BLACK AND WHITE PHOTOS ARE OFFERED FOR SALE HERE FOR THE VERY FIRST TIME. THEY HAVE BEEN MADE FROM ORIGINAL NEGATIVES OR ORIGINAL FIRST GENERATION PRINTS, MANY OF THEM ARE 50 YEARS OLD AND SOME DATE TO THE EARLY 1920's AND 1930's. THE RARE OLD DETROIT ORIGINAL PHOTOS AND BLACK AND WHITE NEGATIVES USED FOR THESE PRINTS HAVE BEEN OBTAINED FROM HISTORICAL SOCIETIES, NATIONAL ARCHIVES, THE LIBRARY OF CONGRESS AND NUMEROUS PRIVATE COLLECTIONS. IT HAS TAKEN SEVERAL YEARS TO PUT THESE OFFERINGS TOGETHER ON THIS WEBSITE. MANY OF THESE PHOTOS ORIGINALLY CAME FROM OLD DEFUNCT NEWSPAPER AND MAGAZINE ARCHIVES, WHERE THEY WERE USED ONCE FOR A STORY AND THEN USUALLY JUST THIS ONE ORIGINAL PRINT WAS MADE AND KEPT FOR THEIR ARCHIVES. HENCE, THESE HISTORICAL IMAGES WERE NOT ORIGINALLY MADE TO BE FOR SALE, BUT WERE TO BE USED AS IMAGES FOR NEWS STORIES AS THEY UNFOLDED--MAKING THESE IMAGES EXTREMELY RARE HAVING SURVIVED SO MANY YEARS. VERY FEW OF THESE IMAGES HAVE EVER BEEN OFFERED FOR SALE TO THE PUBLIC UNTIL NOW. THE ORIGINAL OLD DETROIT BLACK AND WHITE PHOTOGRAPHS HAVE DIGITALLY BEEN RE-MASTERED AND ALL MAJOR FLAWS, SUCH AS TEARS, SRACTCHES, MISSING PIECES, FOLDS, INK STAINS ETC. ON THESE RARE PHOTOS HAVE BEEN PAINSTAKINGLY REMOVED AND CORRECTED AND HIGH QUALITY PRINTS OF THESE HISTORIC RARE DETROIT BLACK AND WHITE SEPIA TONED PHOTOS ARE NOW OFFERED, FOR THE FIRST TIME, ON THIS WEBSITE WWW.OldDetroitPhotos.COM . THESE PHOTOS HAVE BEEN BEAUTIFUL RESTORED AND ARTISTICALLY SEPIA TONED AND OFFERED IN A LIMITED EDITION OF INDIVIDUALLY PRINTED PHOTO PRINTS. THEY ARE READY FOR DISPLAY IN YOUR HOME OR OFFICE. HERE IS YOUR CHANCE TO OWN AND ENJOY SOME VERY SPECIAL AND UNIQUE DETROIT PHOTOGRAPHIC HISTORY.